West African governments have received some USD 18.2 billion in Chinese loans since 2000. The amount of loans has progressively increased and reached, on average, about USD 2 billion per year over the past five years. Nigeria is the top recipient of Chinese loans in West Africa, followed by Ghana, Côte d’Ivoire and Senegal. This is nearly ten times less than the Chinese loans to Angola and less than half of the loans to Ethiopia or Kenya. On the other hand, Burkina Faso, Gambia and Guinea-Bissau have not yet received any Chinese loans. With the new government in place, Gambia’s ties with China are expected to grow, especially with Banjul’s USD 177 million port expansion project. Similarly, Burkina Faso resumed diplomatic relations with China in May 2018 when it accepted the one-China policy. In that country, China has already announced the construction of a hospital worth USD 253 million and negotiations for a concession loan to build a new 300 kilometres highway between Ouagadougou and Bobo Dioulasso are underway (USD 1.3 billion). The majority of Chinese loans to West Africa continue to fund infrastructure deals, mostly transportation (roads, railways, ports) and electric power projects. As regards increasing concerns about countries getting caught in a debt trap, the overall situation in West Africa is less worrying than in other parts of the continent. 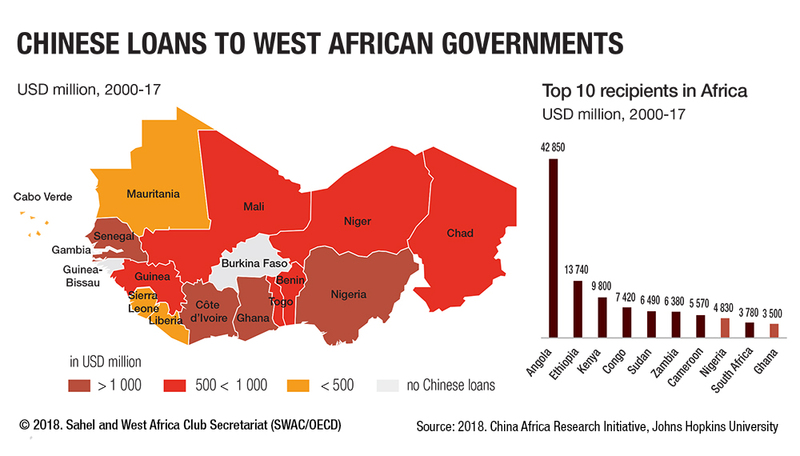 The amounts of Chinese loans in most West African countries are relatively small and have not contributed significantly to debt problems. Chinese loans to Ghana represent only 12% of Ghana’s total external debt (USD 29 billion). However, IMF warns of rising African debt, in particular in countries that already have heavy debt loads (Cabo Verde, Gambia, Ghana, Mauritania and Togo). Moreover, countries with fluctuating commodity prices such as Chad and Nigeria are the most at risk.